Enter the following initials and pressing the indicated buttons to enter that initial: S (C + Start), N (B + Start), and K (C + Start). 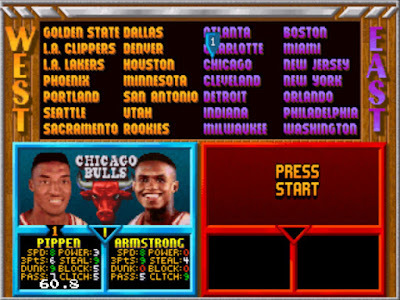 Then, press C + Start at the tip off announcement. 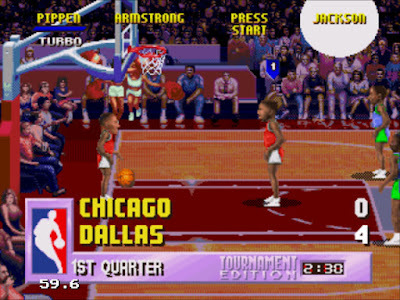 Press A(4), then press and hold A again at the "Tonight's matchup" screen until the tip off. Sweep the D-pad in a Full-Circle while pressing B(13) at the "Tonight's matchup" screen. Press A(7) then hold B + C + Up at the "Tonight's matchup" screen until the tip off. Sweep the D-pad in a clockwise Full-Circle while pressing A(15) at the "Tonight's matchup" screen. Hold the last button press until the tip off. Press A(13) then hold A + B + C at the "Tonight's matchup" screen until the tip off. Press B(7) then hold B + C + Up at the "Tonight's matchup" screen until the tip off. The fire, goal tending, and turbo power-ups will be enabled. 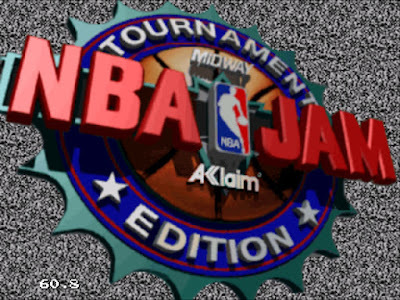 Press A then hold A + B + Down at the "Tonight's matchup" screen until the tip off. Press A(13), then hold B + C at the "Tonight's matchup" screen until the tip off. The entire game will be faster. Enter one of the following initials and hold Start while the third initial is highlighted. While holding Start, press the indicated button. The corresponding player will appear on the team selection screen on any team selected.